Chris Eubank Jr landed the biggest win of his career to leave James DeGale's future in the balance with a unanimous points victory at London's O2 Arena. In a contest which struggled to find a flow, Eubank Jr forced a count in round two after a stinging left hook. 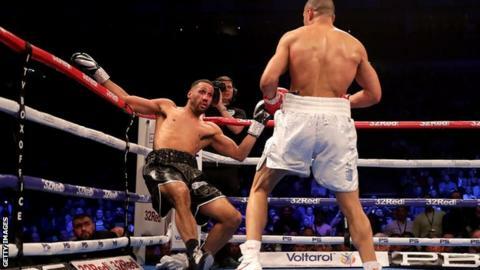 Two-time world champion DeGale boxed tentatively from range but paid in the 10th when a close-range left hook sent him reeling and forced another count. DeGale never threatened a stoppage and the cards read 114-112 115-112 117-109. "I'm back where I need to be - at the top of the food chain and now I'm coming for all the other belts in the super-middleweight division," Eubank Jr, 29, declared. DeGale, 33, held his hand aloft as the scores were read but he was well beaten by his fellow Englishman and, having stated he would likely retire if he lost, his future in the ring is uncertain. "I'm going to go back, talk to my team and talk to my family," he said. "I've been to the heights of boxing, I've won an Olympic gold medal, won the world title twice, made history and I've boxed the best around the world. I've left my mark in boxing." The 2008 Olympic champion showed swift movement in patches but his single shots from range were overwhelmed by flurries of activity from Eubank Jr. In truth, DeGale showed guts to try to keep his feet after left hooks opened him up in the second and 10th, and he somehow stayed upright again after another left hook in the final round. The margin of victory even accounted for a point deduction Eubank Jr was handed in the 11th round when, shortly after landing a devastating uppercut, he picked his rival up on his shoulder in a grapple and threw him to the canvas. In his first contest under the guidance of trainer Nate Vasquez, Eubank Jr showed more patience than in previous elite-level fixtures and, aside from a brief lull around the midway point, always looked the more dangerous of the two. The Brighton fighter answered criticism in performing under pressure having been exposed in defeats to George Groves and Billy Joe Saunders. He insisted he had "made a statement", while his father - former two-weight world champion Chris Eubank Sr - said he was "ecstatic" having said he was "not convinced" his son would win in the build-up. Eubank Jr: "I've been working on my jabs, he is a very slick southpaw but the game plan worked, smart pressure, not getting too ahead of myself, picking my shots and choosing my time to attack. "I dominated pretty much every round. He is a hell of a skilled fighter but my heart and tenacity got me there. A lot of people said I was going to get my head jabbed off and not stand with a proven boxer. It was the most important fight of my career and I've made the statement. It is belt season, it is collection season." DeGale: "Chris is tough, he is a good prospect, he was on it. I just didn't do enough. There were a lot of wild punches, punches I didn't see. He was nicking the rounds and I have to go back and watch it. I just didn't do enough." Chris Eubank Sr: "To get this win tonight and for Junior to be at the top of this pay-per-view channel, we are blessed. "Nate Vasquez is a good trainer. He has been effective. I like him. Let's see what Junior can go on and do. When he uses his jab, which he didn't do too much tonight, he can be sensational." Lou Di Bella, promoter of Deontay Wilder: Awful fight. Sadly, James appears to have little left in the career tank. Too bad. Looks like a shadow of his old self. British trainer Shane McGuigan: As much as Chris Eubank mocked me in the build up against Groves, it was brilliant to see him elated when Jr's hand was raised. DeGale has to call it a day now and Eubank Jr still needs to work on his footwork to beat the top guys but the division is wide open. Former world featherweight champion Barry McGuigan: Spot on from George Groves tonight on ITV. James DeGale should throw in the towel, he's had a great career. British light-middleweight Anthony Fowler: Sad to watch that. Sometimes age catches up with you. I'm gutted for DeGale. He will be remembered as the first Brit to win Olympic gold and then a world title in the pros. #Legend. Well done to Eubank on the win.